Wyatt was diagnosed with Duchenne Muscular Dystrophy in Jan 2009. Since then, things have not exactly gone the way we planned. We moved out of our dream house, My husband lost his job (but found a new one) and the medical bills have been astronomical. strong and as active as possible. What an outstanding organization! 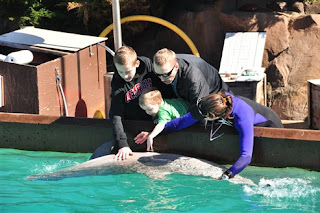 We were given a very special vacation to Sea World and Disneyland, where Wyatt's dreams really did come true. For 5 short days we didn't have to think about anything except having fun. And fun we did have. every single detail, we just needed to show up. We also met a TSA agent, who got us through security quickly. She walked us all the way to the gate, and even played with Wyatt and Carter while we waited. We met the pilot, co-pilot and all the flight attendants....the kids even got to sit in the cockpit. The pilot and flight attendants gave Wyatt gifts and announced his name over the plane intercom. Wyatt waiting for our plane. I love this picture. When we arrived in San Diego two Make a Wish volunteers Kelly and Gracie met us. They got our luggage for us and we followed them to the hotel. They got us all check in, then we were on our own. The hotel we stayed at was the Hyatt in Mission Bay. It was really a lot of fun. The kids tried to go swimming, but quickly realized it can even get a little chilly in California, it is after all March. 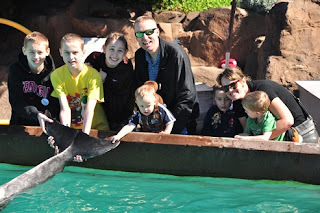 That night the kids were really restless, Sea World was in the morning and Wyatt couldn't wait for his DOLPHIN DAY! We woke up the next morning and went to IHOP for breakfast. (for weeks before our trip Wyatt kept saying how he wanted to go to IHOP). So we did. He had pancakes, bacon and hash browns. Everyone had a great breakfast, before our day of fun. We explored Sea World for a few hours. The kids went on all kind of rides, there was something for everyone. 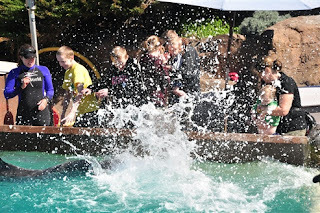 The DOLPHIN Adventure, was unbelievable. The kids got to touch, feed and learn lots of great facts about dolphins. I was a really fun experience for everyone. All the kids were able to participate. This was a once in a lifetime event, I will never forget it. To end our day at Sea World we went to the Killer Whale show. They have a brand new baby Killer Whale who was born on Valentines day. 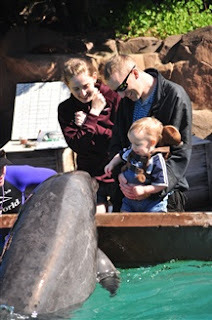 The baby whale stayed close to Mama, Kasatka, so we couldn't see it very well. But look close you might be able to see it's outline in the water. After a great day at Sea World we went to this pizza place in the middle of no where called "Lefty's Chicago Pizza!" It was really good. The kids loved it! Travis took lots of pictures inside the restaurant. I didn't go inside, but I guess it was pretty cool. It was decorated with all Chicago stuff: sports teams memorabilia, etc. The next morning we got up early for our 1 1/2 hour drive to Anaheim. Make a Wish rented us a van, similar to ours for the trip. We were very comfortable and the trip went relatively fast. The first thing Wyatt wanted to do was go to CARS LAND at California Adventure. People aren't kidding when they say it looks like you're walking into the movie. They have every detail exactly right. It was so cool. We spent the second half of the day exploring Disneyland, going on rides, and eating lots of junk food. The kids had a blast, yes, even Anthony, though he will never admit it. We went on several rides, shopped and watched the fireworks. There is a Make a Wish room with snacks, drinks and a place to rest. We visited there and Wyatt got some apple juice. with school and have started to figure out what she wants to be and where she wants her life to take her. I was sad! Wyatt loved the parade (Brady and Carter thought it was pretty great too). I guess, not knowing where the future will take us, just caught up with me at that moment when Mickey and Minnie came dancing down the street. the run of the place. It was really empty, so we could walk around and take pictures. After Bubba Gump we headed to the airport. The trip home was a little more challenging then the trip to California. The van we rented was too big to fit in the rental car return area. So Wyatt's Dad had to go track down an Avis employee. We were cutting it close on time and I was beginning to get a little stressed. But I have to say, Avis is amazing. They could tell we were running out of time, so an Avis employee drove us to check-in. Saved us so much time. I'm only going to rent from Avis from now on, they were so great. We were blessed to take this Magical Journey (hahaha, I know magical, Disneyland, not trying to sound cheesy). I will never be able to thank Make A Wish enough. We never would have been able to do this without them. For a week, I didn't have to think about anything but spending time with my babies. What a beautiful gift Make a Wish has given me. I just need to find a way to pay it forward. Thank you Make a Wish! Congratulations!!! I was formerly a Make A Wish volunteer/grantor (had to step down after Kyle's diagnosis - just too hard) and it is TRULY amazing what this group does for kids. We were also (un)fortunate to have our son, Kyle, receive a wish as well last year (January 2012). We spent an amazing weekend in Chicago and he had a meet and greet with Derrick Rose from the Chicago Bulls (this was his first game back from previous injury). MAW truly gives your family the opportunity to just live in the moment and have absolutely everything taken care of. There are truly some amazing people out there.